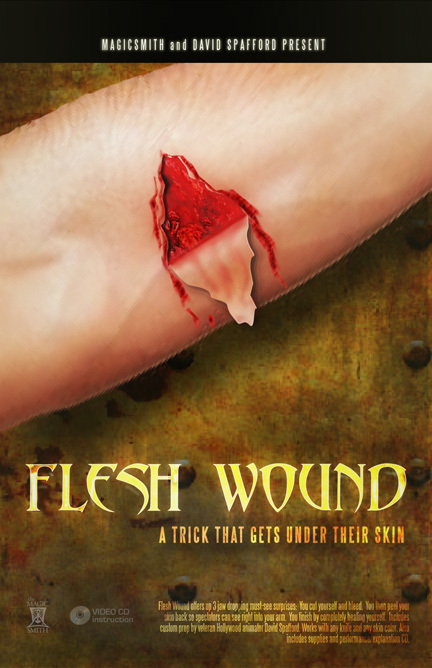 Flesh Wound is the most gruesome, most graphic, most disgusting magic trick ever. Forget needle through arm. Forget eating fire. Capture their attention with something they’ll never forget. Here’s what happens… Take a knife and cut straight into your forearm. Blood starts to ooze from the fresh wound as you cut. After you’ve carved out a good chunk of your arm, you reach over to the wound and begin to peel the skin away until it hangs down as a loose flap! They can now see directly into the open wound. And now for the best part… close the flap of skin and your arm visibly heals itself. Wipe away the excess blood and you’re as good as new. It’s absolutely unforgettable. Flesh Wound offers three jaw dropping must-see surprises – you cut yourself and bleed. You then peel your skin back so spectators can see right into your arm. You then finish by completely healing yourself. If you like you can produce a coin, folded chosen card, or other object from the open wound…. Warning, choose your audience carefully for this effect. Reset time is under a minute, and it works with any knife and any skin color. It includes the custom Flesh Wound prop designed by veteran Academy Award winning animator David Spafford. You also receive blood supplies plus a performance and explanation video-CD detailing the entire routine.